Otis, Boggs & Owlberta of Metroparks of Toledo Area participate in parades! Here is some insight and theory into how to keep the ball rolling in your mascot campaign. A character is a lively, relatable and recognizable being that represents your brand. 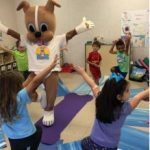 It’s crucial to focus on making your mascot a “character” and coming up with a personality, and a storyline, that is both relatable to, and appropriate for yourdemographic. Why? Because characters with real virtues and struggles are likeable. When your brand character is liked and remembered, your brand is liked and remembered too. Think about memorable brand characters like Cheetoh’s Chester, Pillsbury’s Dough Boy and Lucky Charm’s Leprechaun. Post’s Sugar Bear has it right and most recently slapped our hands… we congratulated them on such a successful mascot costume campaign over social media… He replied “mascot?What’s that? I’m a bear and I like rollercoasters”. They’ve got the right idea!A likeable character that your consumers have an emotional connection to will even goes so far as to drive sales and loyalty. In fact, acclaimed neuroscientist, Antonio Damasio, made a ground-breaking discovery several years ago when he determined that, “Even with what we believe are logical decisions, the very point of choice is arguably always based on emotion” (Camp, Jim). Therefore, having a cute, cuddly and relatable bear character that warms the heart of your consumers may arguably be more lucrative for you than typical hard- ball and logic- based sales tactics. Make it someone’s responsibility to manage your mascot. In our humble (and completely unbiased) opinion, “Mascot Manager” would look pretty cool on a resume. By assigning a particular person or team to the task of “managing your mascot”, you are insuring that there is someone whose job it is to stay on top of potential marketing opportunities, and character development. Also, consider making this person in charge of your character’s cleaning, maintenance and storage (trust me- you’ll thank us for that!) You really don’t want to find your mascot growing dusty in the janitor’s closet after 3 years because no one was keeping tabs on his whereabouts.You may want to also consider having your performer act as your “Mascot Manager”. Please read our article on how to best pick a performer from the previous issue of our blog. 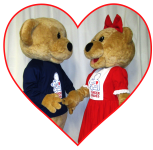 Teddy and Tessie (of Tender Wishes) renewed their vows in 2012.
methodically touch on things like personality, voice (for social media purposes), likes and dislikes. Brainstorm regarding code of conduct and don’t be afraid to get into the nitty gritty, like determining where your mascot performer will change. Ever tried changing into a mascot costume in the backseat of a car? 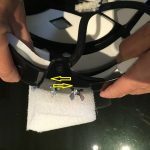 (Perhaps there’s a different article here).Keep in mind that we provide you with a manual that gets you started with tips regarding details like this, but it will be up to you to continue to develop your plan as your mascot program unfolds. Be sure to include milestones in your character’s plan. Perhaps a little brother is born for your character? Perhaps he celebrates a big birthday or learns something new and exciting? Tender Wishes created a splash when their adorable teddy bear characters got married and years later renewed their marriage vows (because who doesn’t love the idea of teddy bears getting married?!) Don’t just stop at milestones. Give your character hurdles to overcome as well. David Altschul is the CEO of a highly reputed branding company called “Character”. He offers this wisdom, “People connect emotionally with characters whose struggles are familiar to them, not with characters who superficially look or act like them” (Adler, Carlye). Watch for the right opportunities to connect with the public. Give your mascot a social media presence! In general, performers remain silent while playing a mascot, however, we do suggest having your character make noise over social media! This is your chance to give your character a voice and a way to interact in writing with your fan base without breaking the illusion when he’s out in public. 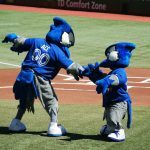 Giving your mascots a social media presence is also a proven “soft sell” approach: “Studies show that brand mascots do resonate with customers, inspiring them to engage in conversation and share content” (K., Elizabeth).Giving your mascot a social media presence will insure that he has a voice that extends past your community, and connects with fans everywhere. It will also give your customers the opportunity to bond with your character and thus with your brand. Make sure to consistently post on your social media feeds, so your fans still know that your character is out there, even if he hasn’t made an appearance in a while. Have a lull in your mascot program? Have your character tweet about the cold he’s getting over or post an Instagram from his great vacation! Keep your mascot consistent/ up to date with brand developments. Remember at the end of the day, that, even if only on a more subliminal level, your mascot is an ambassador of your brand. Therefore, if your brand undergoes drastic changes, your mascot should too. If you change your logo, make sure you have a new branded t-shirt ready for your mascot’s next appearance. If you merge with another company, consider having a second mascot made to represent your mascot’s “new sibling”, or find ways to connect two existing mascots to indicate that they are now part of the same family! Taking the time to put some thought into building momentum for your character will benefit your mascot campaign and therefore your company as a whole! Follow these tips and your mascot will soon be the long- standing and highly recognized face of your company. Mascots don’t quite, grow old and retire without notice. They don’t ask for unreasonable pay raises and if well planned, a mascot can be a continual very long term ‘front man’ for your brand. Keep the ball rolling with a little planning ahead! Once you get started the momentum will carry you the rest of the way! Have some great ideas about building and maintaining mascot momentum? Let us know! Adler, Carlye. “How the Pillsbury DoughBoy explains what you buy.” CNN Money. Cable News Network. October 12th, 2006. Web. September 25th, 2014. Camp, Jim. “Decisions Are Emotional, not Logical: The Neuroscience behind Decision Making.” Big Think.The Big Think, INC. June 11th, 2012. Web. October 10th, 2014. K., Elizabeth. “Personifying Your Brand: The Use of Brand Mascots on Social Media” ContentEqualsMoney.com. Content Equals Money LLC. April 8th, 2014. Web. October 10th, 2014.